Mycroft Masada Holmes: ICTE's first e-newsletter! ICTE published our first e-newsletter today -- it was emailed to everyone who has signed our Declaration Of Religious And Faith-Based Support For An Act Relative To Gender-Based Discrimination And Hate Crimes. Click here for the PDF of the 3-page MS Word document. Welcome to our first newsletter. You are receiving it because you signed our Declaration of Religious and Faith-Based Support for An Act Relative to Gender-Based Discrimination and Hate Crimes. First of all, thank you so much for being part of An Act Of Faith. You helped make the first interfaith transgender event in Massachusetts a huge success – a truly powerful and inspirational experience for everyone who attended and many others. Have you seen the Bay Windows article yet? Those of you who attended and filled out a commitment card – a Tree Of Life “Leaf” – will be contacted by a Coalition member. Thank you for your commitment to take action for transgender equality in Massachusetts. MTPC’s Transgender Equality Lobby Day is this Tuesday, April 7th. Please attend, even if you are not visiting a legislator or can only be there for part of the time, and spread the word -- one of the best and easiest ways is the event’s Facebook page. ICTE will meet outside the front gate of the Massachusetts State House at 9:45 a.m., joining Keshet and its Transgender Working Group (TWiG), Jewish Alliance for Law & Social Action (JALSA), Ohel Tzedek of Temple Israel, the National Council of Jewish Women and other Jewish groups and individuals. If your faith community is attending, please invite them to gather with us at any time during the Day. There will be a panel of speakers including clergy, policy makers, transgender people and family members; light refreshments; and a short lobbying training. Then, prescheduled legislator visits – people will meet with their legislators to thank them for supporting or ask them to support the bill. We realize that we, the members of the Coalition, haven’t formally introduced ourselves to you. Our Co-Chairs are Mycroft Masada Holmes (Chair - Keshet Transgender Working Group (TWiG)) and Rev. Cameron Partridge (Priest - St. Luke's and St. Margaret's Episcopal Church, Founding Member – TransEpiscopal). Our Clerk is Rev. Michael Cooper (Pastor - Metropolitan Community Church / Boston). Richard Juang, Rev. Michael Cooper, Orly Jacobovits, Marla Marcum, Rabbi Daniel Judson. With us is Gunner Scott, Executive Director of MTPC. We’re continuing to gather signatures for our Declaration of Religious and Faith-Based Support for the bill. Do you know people who might be interested in signing? It takes just a few minutes at our website: http://www.InterfaithCoalition.org. We especially need clergy and congregational signatures. We’re organizing postcard-signing events with congregations. These are MTPC’s orange postcards to legislators, asking them to support the bill. Is your congregation interested in organizing an event? Please let us know. We’re supporting interfaith transgender organizing in Central and Western Massachusetts. The focus is planning an interfaith transgender event modeled on An Act Of Faith. Do you want to be part of this conversation? Please contact us. 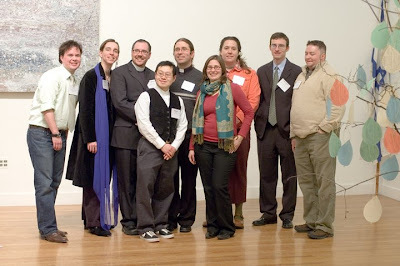 We’re part of the conversations about faith with the Pride Interfaith Coalition, National Gay & Lesbian Task Force, National Center for Transgender Equality, Transgender Religious Leadership Summit, Philadelphia Trans Health Conference and other local and national organizations, conferences and events. We’re collecting and creating educational materials about transpeople and faith. Have you seen effective materials? Are there materials you would like to see? Please share your recommendations with us. Thank you again for your partnership in this work. Together, we can pass the bill into law, and continue to work for transgender inclusion in communities of faith and elsewhere.